This chapter shows the most significant approaches developed so far for the distribution of digital contents with copyright protection, highlighting their most interesting features. These proposals may be classified into two categories: on the one hand systems that try to prevent unauthorized uses of the contents, and on the other hand systems whose purpose is to detect unauthorized uses of the contents and to identify involved offenders. 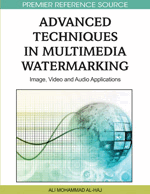 This chapter is focused on the systems that fit in the second of these strategies, most of which are based on the use of watermarking techniques. However, watermarks cannot provide a suitable answer to this issue by themselves, but they must be framed into more complex systems, involving the participation of different entities and the use of well defined protocols which establish the exchange of data and contents among these entities. It is important to point out that cryptography is also a key element in all of these systems and protocols. Most systems developed so far for copyright protection of digital contents can be classified into two broad categories corresponding to two different strategies: systems that try to avoid unauthorized uses of contents, and those that try to detect unauthorized uses.